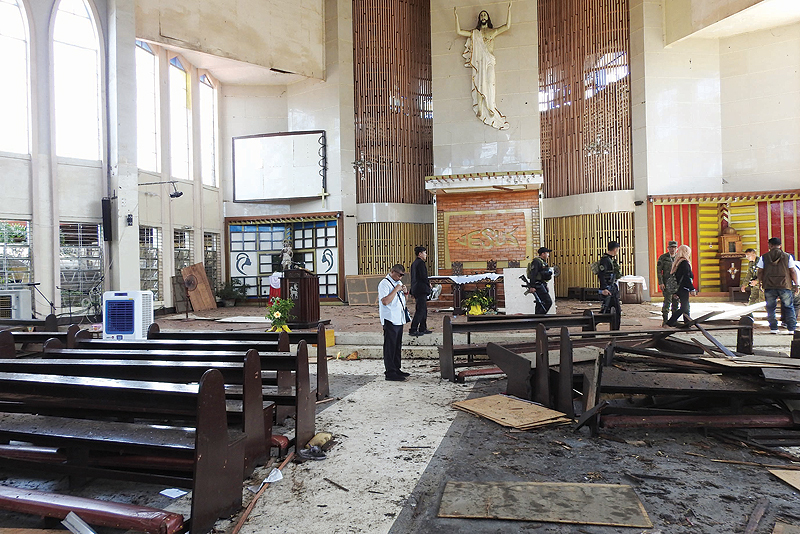 MANILA: A senior Abu Sayyaf operative and four members of the militant group believed to be behind the deadly bombing of a church in the southern Philippines surrendered to authorities over the weekend, the national police chief said yesterday. Kammah Pae, whom authorities believe to have aided an Indonesian couple in the Jan 27 suicide attack, gave himself up to government troops, Oscar Albayalde said. “He was forced to surrender,” Albayalde told a media briefing. “He probably didn’t want to die during the military offensive.” Philippine troops killed three suspected Abu Sayyaf militants and suffered five fatalities in a firefight on Saturday in Patikul, a town in the province of Sulu as troops pursued those behind the church attack. Albayalde said Kammah denied involvement in the twin bombings at the Jolo cathedral that killed 23 people, including civilians and soldiers, but eyewitnesses’ accounts showed he escorted the Indonesian couple. Security forces also retrieved an improvised explosive device (IED) and components from his home, Albayalde added. The five suspects will face multiple murder charges, among others, Albayalde said. However, the investigation into the church bombing in Sulu, a known stronghold of the Abu Sayyaf group, is “far from over,” he added. Abu Sayyaf is a militant organization notorious for kidnappings and extremist factions and has pledged allegiance to Islamic State.